Purchased the mounting system to take on a holiday tour with pianist David Benoit. We had full sized grands each night…fourteen shows in twenty eight days. I used AKG C314’s and got consistently great results each night. I’m very pleased with the product and it has held up well. The Mirizio Piano Mount is exactly what I was looking for. It’s fabulous, well made, fits perfectly, adjusts gently, supports mics securely, looks cool, actually functions brilliantly. It’s perfect. Wonderful. Awesome. Congratulations on a great innovation. I love it. I’m using it in all the grand pianos I record. What a solution! Your Microphone Mount works great. I’ve tested it few times, and next week I hope to have time to take photos. It is a great tool for studio, but for live recordings and performances it is a MUST HAVE! I was searching for a way to mic my church’s grand piano. Sound quality was important, but I also wanted something that could be left in place and simply work week after week. I wanted something that would disappear, and not distract from the instrument or stand out in our sanctuary. The Mirizio Microphone Mount has been great! I chose small diaphragm condenser mics, mostly for feedback prevention. The system design is simple, but offers a lot of mounting flexibility. The hardware is very rigid, and is definitely built to last. It simply lays in place once adjusted, I can see no way it will ever leave a mark on our piano. I had a couple of questions ahead of the purchase, and received prompt and courteous responses. I am very pleased with the product and the company. “Finally, I have the grand piano microphone solution I’ve been waiting for: a fully-adjustable bridge mount that allows me to choose which mics I want, where I want them, and it works with any stick/lid configuration. Whether I choose my Schoeps, AKGs, Neumanns or Earthworks, the only thing I didn’t expect using the Mirizio Microphone Mount was the number of compliments I have received on how great the piano sounds. Thanks for offering a practical, reliable solution at a great price. Much appreciated and highly recommended! the craftsmanship and construction of this unit was top shelf , and the flexibility of it was fantastic! makes this a must have piece! 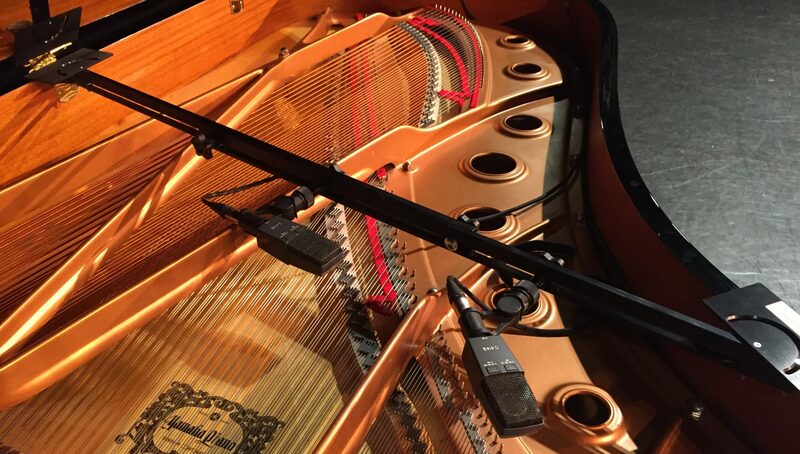 “As a professional piano technician (and former audio tech) I couldn’t be happier with the Mirizio Microphone Mount. The design and construction of the unit is simple, high quality and brilliant. It is now incredibly easy to close mic a grand piano virtually anywhere in the scale, using any microphone, with the piano lid either open or closed without damaging the instrument by using clamps or tape. Leonard has created a wonderful device that pianists, piano technicians and audio engineers will all find extremely useful and a joy to work with. Thanks Leonard! Touring Technician for Paul McCartney, Ryuichi Sakamoto, Ronnie Milsap et. al. I have used the Piano mount twice so far with national level acts. Rave reviews from all. It is very easy to deploy and you can even close the piano lid if you use the right microphones. I have used it with Audix Micro Ds and Shure sm181s both worked great. Well worth the price. We are very pleased with the mounts! We used them to mount AKG 414s in both of our pianos. Very pleased. Hi Leonard,This is Ralph LaRocco and I’m the sound engineer for the Cincinnati Symphony and Cincinnati Pops orchestras. We purchased one of your piano mounts in June, there is almost always if not all the time a grand piano on our stage. All of our Pops concerts in particular, are reinforced and the rhythm section is a large part of it. There is always a piano in the section. “I’ve been waiting for a reasonably priced mic mount for grand piano for a long time. The Mirizio mount is perfect. Every house of worship in America should have your mount inside any of their pianos they are miking during services. As the principal engineer and co-owner of Cornerstone Studios in Wichita, KS, we will definitely be purchasing your product for our studio use as well for our many live recordings and broadcast worship events. This is truly a better mouse trap and a great problem solver. No respectable mic closet should be without one.Kudos and Blessings! someone who takes pride in their workmanship. PS, Insanely quick shipping too!